Products have historically been designed for convenience but with no consideration of the waste left behind. Take the coffee pod for example; Canadians use 2.8 million of them every day and most end up in the garbage. Take a raw material, make something, use it, and dispose it; that is a linear economy. The solution is in the circular economy where we design products so resources can be reused and reinvested in new products again and again. How is this different from recycling? Rather than having to find a recycling solutions after a product is designed and brought to market — like the coffee pod — recovery and material reuse is part of the design and manufacturing process of the product from the beginning. A circular economy also supports the idea of access over ownership. Streaming services like Spotify and Netflix rent access to content without you needing to own anything like CDs and DVDs. By shifting to access over ownership, the responsibility falls to manufacturers to make longer lasting and more efficient products that are designed with repair and reuse as primary considerations. 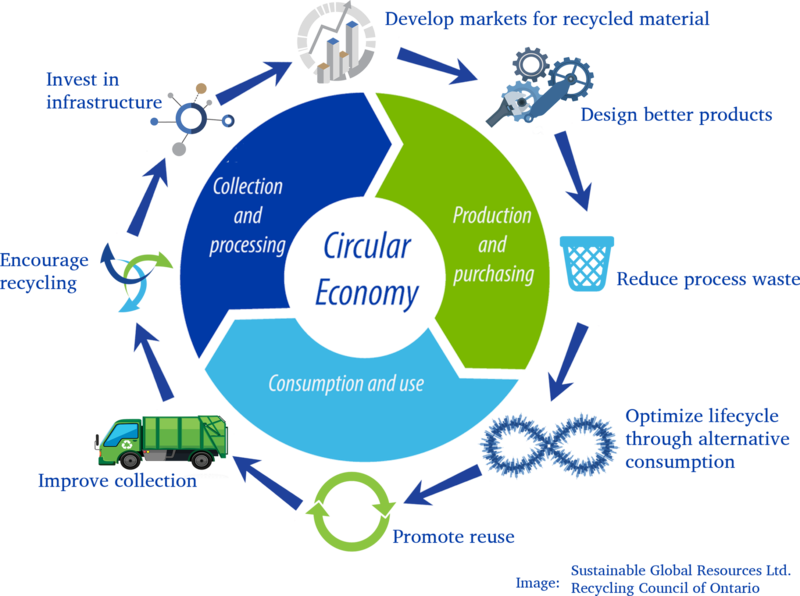 How can we advance the circular economy? Purchase smartly designed products meant to be reused, refurbished, and dismantled. Support companies that offer take-back of products after use. Embrace access over ownership. Use procurement and purchasing power to influence greater sustainability. It is estimated that Organisation for Economic Co-operation and Development countries spend 12 per cent of their GDP on public procurement. With a $1.9 trillion GDP Canada spends $230 billion on procurement alone, and Ontario spends $89 billion. By leveraging purchasing power to drive sustainability we can hasten the transition to an effective circular economy. 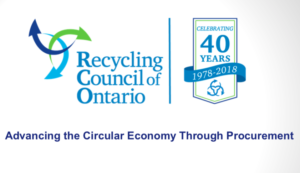 That’s why Recycling Council of Ontario is taking an active role to encourage and showcase governments and organizations on using procurement as a mechanism to address waste reduction and greenhouse gas emissions, and benefit from the associated costs savings. In June 2019 we are hosting Canada’s first ever Circular Procurement Summit for the public sector. On April 12, 2019 we hosted a complimentary webinar on circular procurement. In July 2016 the City of Toronto adopted a Long-Term Waste Strategy that includes several recommendations related to waste reduction and advancing the circular economy. RCO was invited to be part of the Stakeholder Advisory Group, and offered feedback and comment on its composition and priorities. A component of the strategy addresses the importance of procurement to fulfill waste reduction goals. 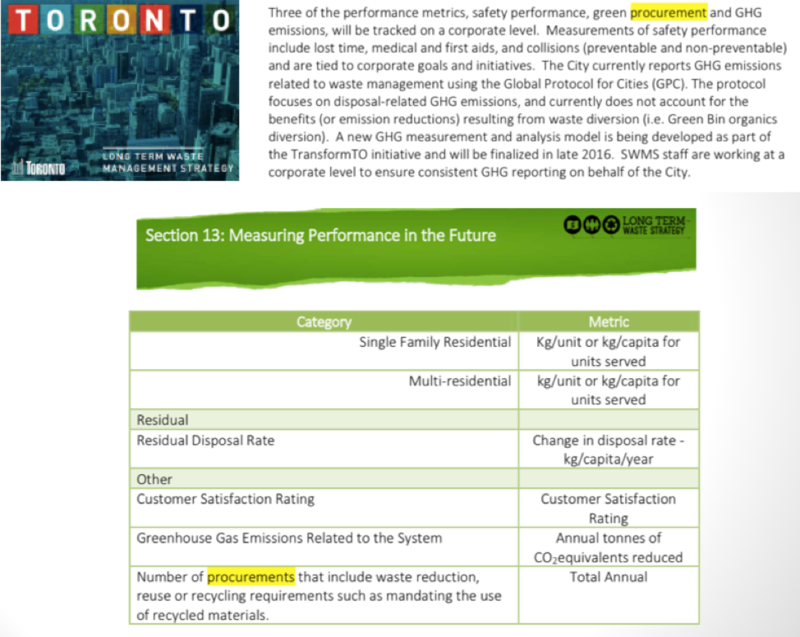 In November 2017 Councillor Michael Layton (Ward 19 Trinity-Spadina) recommended the Director of Purchasing & Material Management, in consultation with Toronto Solid Waste Management and relevant stakeholders, including RCO, develop a strategy for city procurement (PDF) to drive waste diversion and the circular economy. 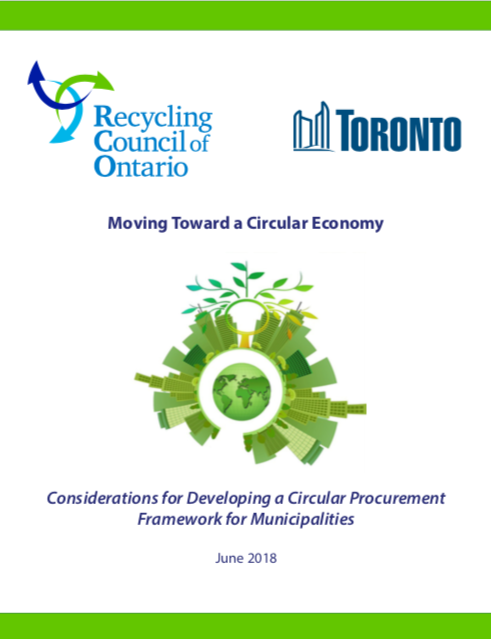 On June 5, 2018 the Government Management Committee considered Implementation Plan and Framework for Integrating Circular Economy Approaches into City Procurement Processes to Support Waste Reduction and Diversion (PDF) and adopted it without amendment. 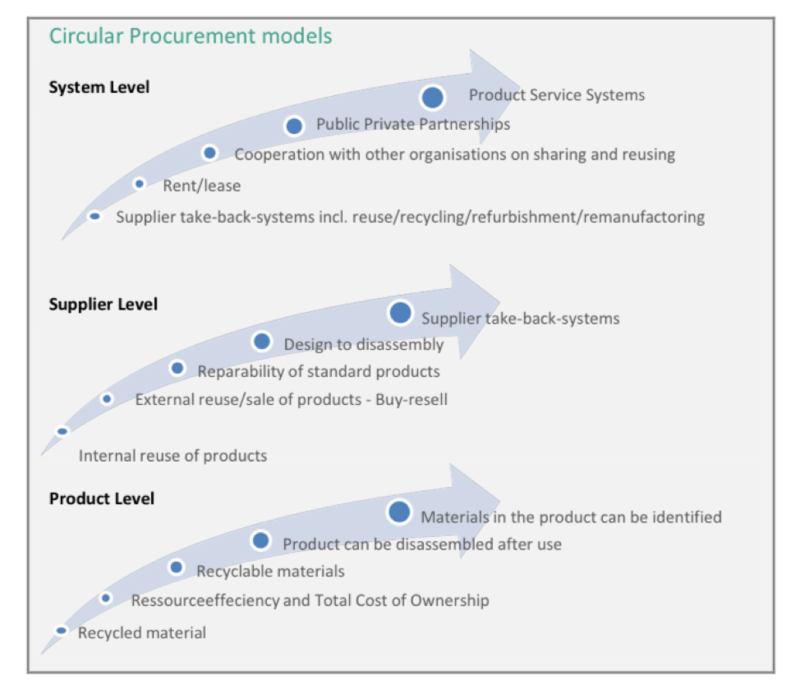 RCO intends to continue to act as a resource for leveraging procurement to move the circular economy forward with sector-specific workshops and other opportunities. For more information, we encourage you to become an RCO Member for notices and discounts to our various events.